The handle's quick release mechanism easily switches any 1/4'' hex accessory between a power tool and hand tool. Includes Switch Drive handle and three 2'' (51 mm) magnetic power nut drivers (1/4'', 5/16'', and 3/8''). Large Cushion-Grip handle for greater comfort and torque. Switch from a handle to a drill in a snap! Power drills make quick work of large fastening jobs but some times, you still need the finesse of a hand tool. 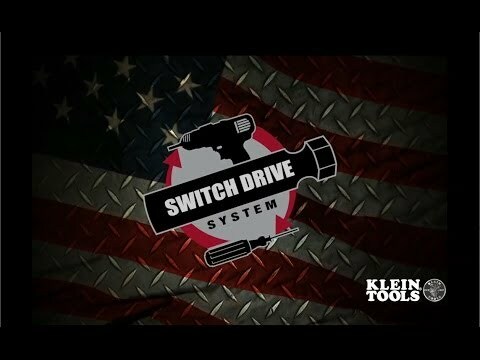 Klein's Switch Drive Handle System allows you to easily alternate any accessory with a power groove between a power drill and hand tool minimizing the number of tools and saving space.The patented quick release mechanism in the handle secures any 1/4'' hex shaft to quickly convert an impact rated accessory to the most rugged, long lasting, powerful hand tool in your bag. NOT insulated. Will NOT protect against electrical shock.